Most big-time programs are familiar with the black-hearted give-and-take that comes with an instate rivalry, no matter the state or the stakes in any given year. But there are rivalries that bring the intensity every time the warring factions get together, and there are rivalries that bring so much drunken vitriol that the sides probably shouldn't get together, ever. Kustra said it's a "cultural issue,'' pointing out an article last week in the Argonaut, the University of Idaho student newspaper. The headline of the article was, "Who do we hate?'" "This is a great example of why my wife and I no longer travel to Moscow games,'' Kustra said. "It's a culture that is nasty, inebriated and civilly doesn't give our fans the respect that any fan should expect when visiting an away team. ... 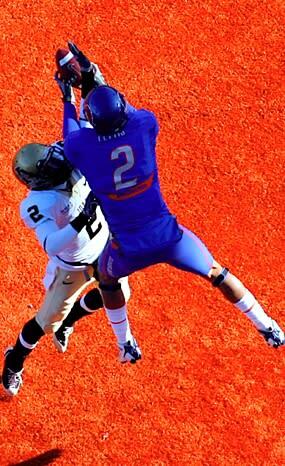 I don't think at Boise State you're going to find that ... For me, this is not about football. For me, this is a cultural issue. "I've seen rivalries all over America, Oklahoma-Oklahoma State, Texas-Texas A&M, Kansas-Kansas State, but you can go inside those rivalries and you'll find all kinds of slams and digs and whatever, but I've never seen the nastiness aimed at the quality of our academic program that I find here in Idaho from the University of Idaho Vandals and as long as that goes on, why would I want to encourage a game where people don't know how to act like grownups?'" We should assume that Dr. Kustra is aware of the Internet, but clearly he's unfamiliar with the extreme depths of human depravity, incivility and unfettered hate it has facilitated. Certainly, if he thinks there's anything unusual about the vitriol in his neck of the woods, he's never found himself on a random al.com thread that instantly devolves into a childish round of Bammer/Barner name-calling (which is every al.com thread regardless of the article). Boise and Idaho are still calling each other by name, I think. They haven't engaged in any bench-clearing brawls in a while. I'm not aware of any Vandal or Bronco fans opening fire on one another, thankfully. These relationships tend to get a little nasty (NSFW) everywhere, and more than a little inebriated. But for the rest of the country knows, all these things and more go down between drunken, professorial Idahoans in the bowels of the Kibbie Dome every year, unbeknownst to anyone in the outside world. Even Boise coach Chris Petersen, aka the Nicest Coach in America, was adamant that Bronco fans do not want to go there. And why would they? Just listen to Robb Akey's voice, man: A rasp that menacing can come only from a frozen, forbidden hellscape that slowly descends on outsiders until their grip on reality disappears over the far horizon. It confirms what you already knew in your bones: Once you've been to Moscow, Idaho, you'll never want to go back. Matt Hinton is on Twitter: Follow him @DrSaturday.